Heyo! This is a trench system i made out of styrofoam from Home Depot, A Saw, Liquid Nails, Card as a base, and a dremmel to make the poc marks on the sides. Any helpful advice on improvements or just comments would be appreciated. Thx! Yup. It&#39;s going to need some basing matiral and paint to look right (just do it the same way you would make a normal base). Bought some texture for my brown paint today so the trenches will look rocky and cut out the wood sections to be used on the walls and ground of the trenches too. Yes, I agree. THe corners are a bit sharp. Nice work. Thx guys! I&#39;m going to take in the corners right now! round the corners a bit. you planning on using these for 40K and fantasy? if you mentioned it i missed it. 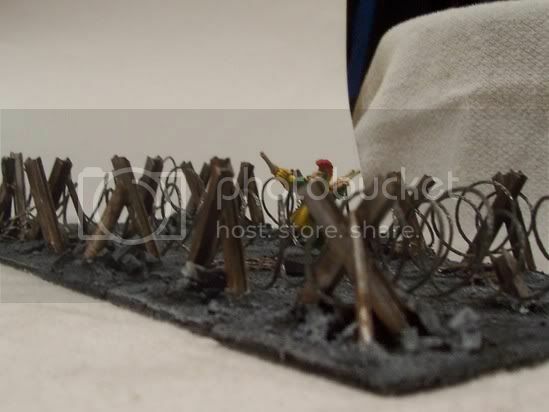 but if not i would stick some courrugated card in there along the walls to look like sheet metal or whatever was used to shore up the trench walls. screen mesh would look good on the planking and add more detail when painted. the tip in one of the older WD mags about taking a rock with lots fo texture and pushing it in the foma to imprint texture is an idea if your not gluing sand down, but would rahter see the sand. wrap this tightly around a pen or a marker and then let uncoail and losen the coil back up to about ht ediameter of a quarter. very cheap and easy to so, primer it black drybrush silver and black ink it. 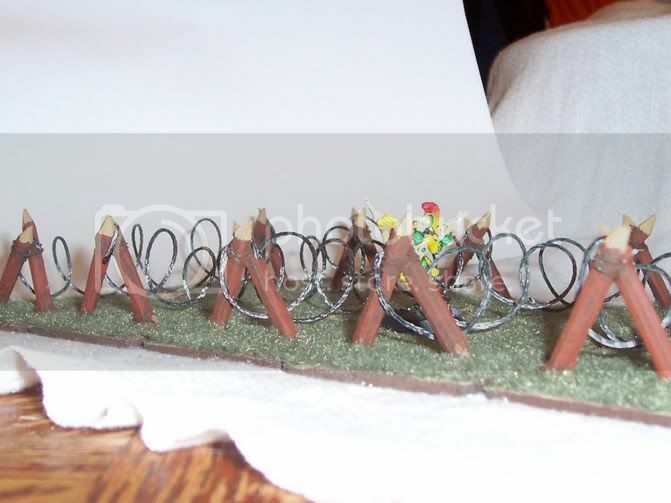 here is a couple pic of some razorwire i did the same way for some customers.